OK, so where do we begin? First, I snooped around a bunch of recipes trying to find a tomato sauce that is more than just tomatoes. 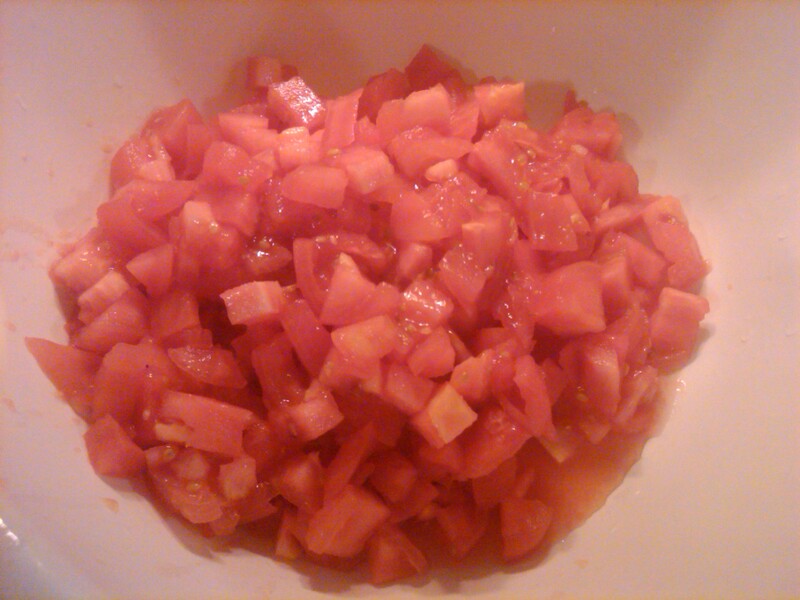 I found a meatless tomato sauce from the garden on Eat The Blog. And I settled on it because she used it in her own homemade lasagna. And I didn’t have much frame of reference for what I wanted for noodles so I also stole her homemade noodles recipe. I ended up halving the above recipe because I thought it would be too much. Next time, I will make the whole thing. So if you’re making a full batch of lasagna (9X13 pan), I recommend making this whole batch. 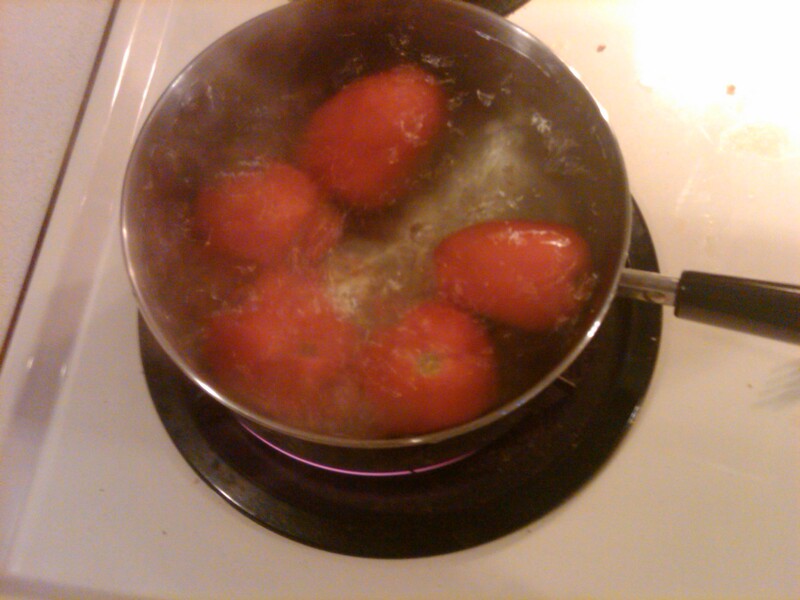 I used a variety of tomatoes, not just Roma, and I started by blanching them. OK, I’m not sure if I blanched them, I don’t know what that means. All I know is when Kendra gave me a salsa recipe she told me to boil the tomatoes until the skins cracked then put them in cold water and peel off the skins. If that’s what blanching is, that’s what I did! After that I cored them and took some of the seeds out. But I wanted a kind of juicy sauce so I didn’t totally squeeze all of the juices and seeds out. 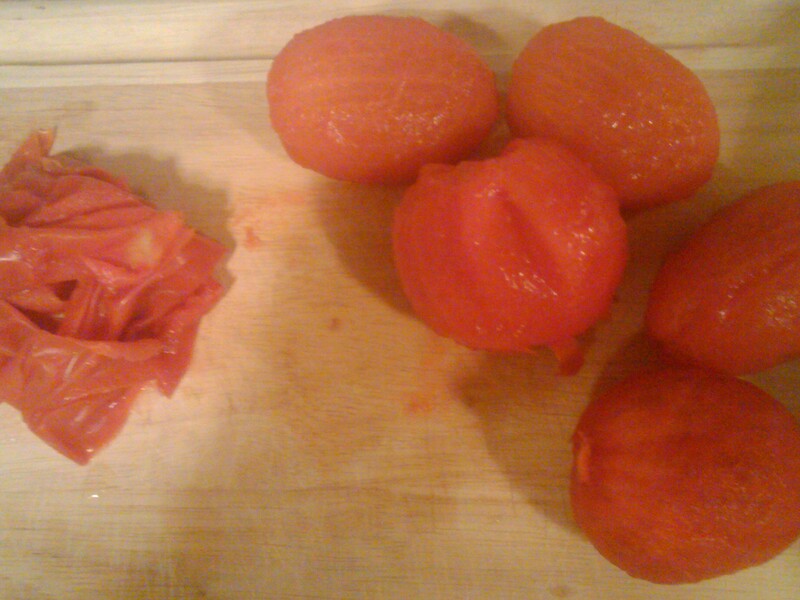 My version of blanching… Boil the crap out of tomatoes until their skin cracks (much like me after 10 minutes in the sun). Then drop in cold water until they’re cool enough to handle, and the skins come right off. 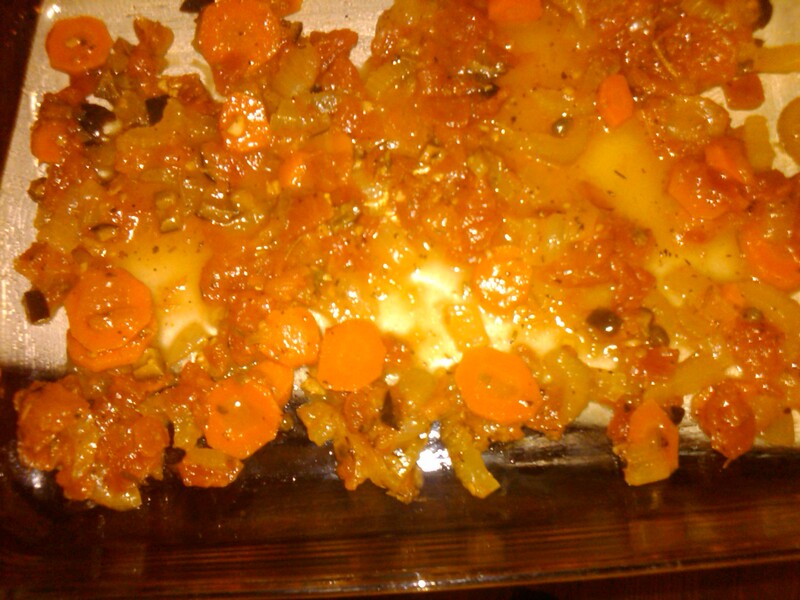 After that I chopped up the onion, carrots, celery, and cloves of garlic. Yes, real garlic. It’s my new thing (rather than the crushed, jarred garlic). 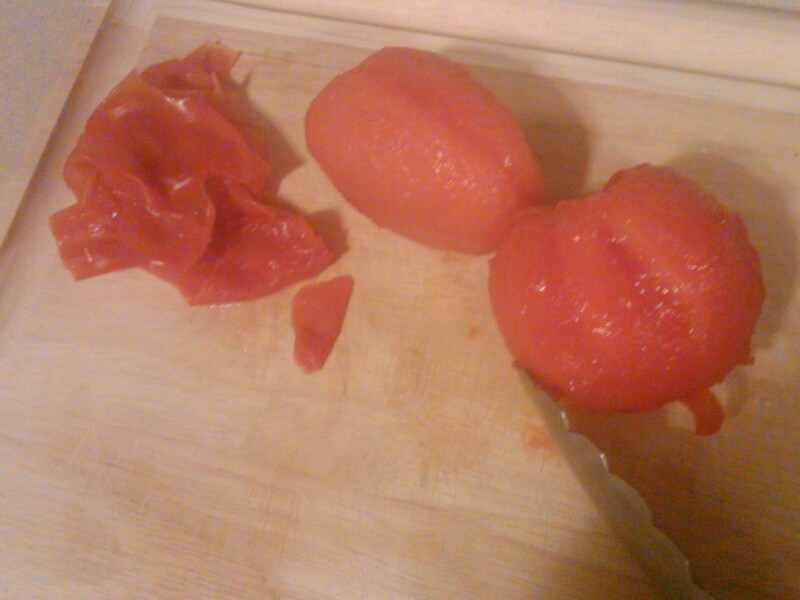 I forgot to buy a green pepper, but this is where you’d chop that as well. 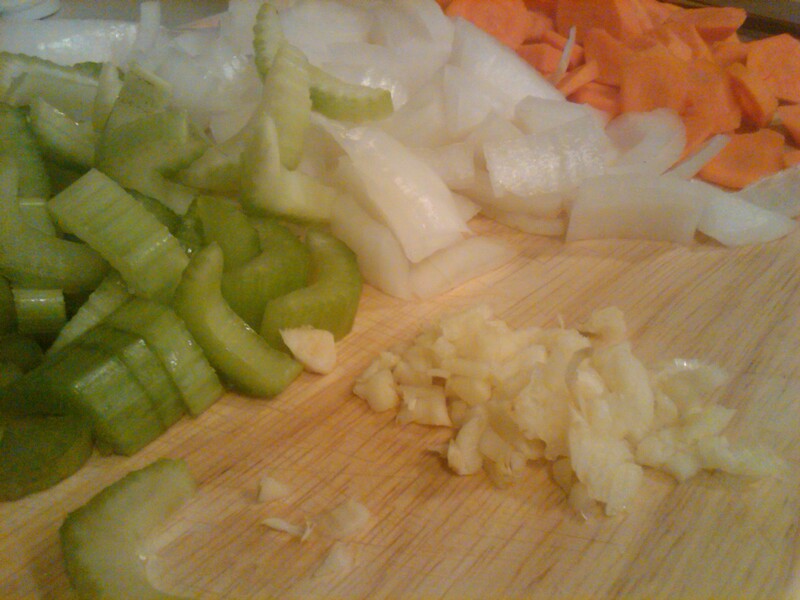 Chopped celery, onion, carrot and garlic. I put half of the olive oil in the bottom of my pan, over medium heat. Once the oil was hot, I added the garlic and let it brown for few minutes. 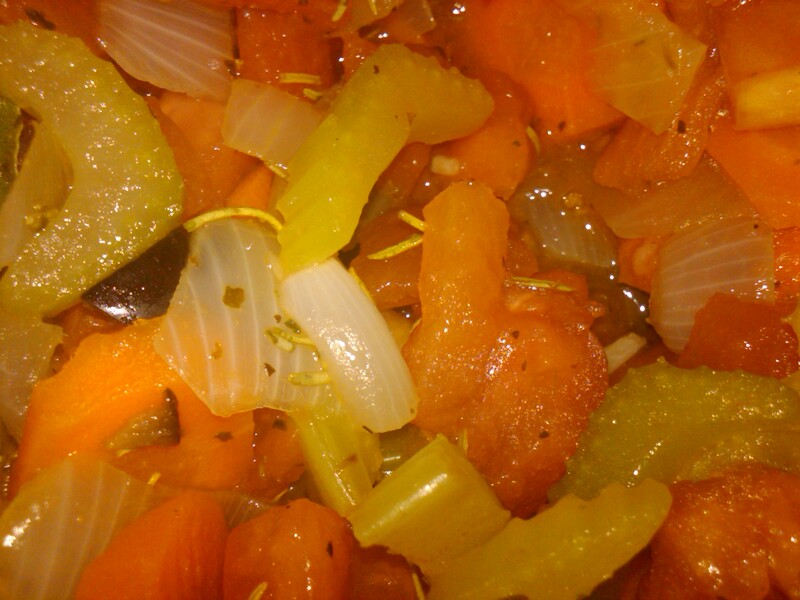 Then I dumped in the onions, carrots, celery and bay leaves, stirring fairly regularly so nothing burned to the bottom of the pan, and cooked until the veggies were soft. While it was cooking I measured out my capers and spices, and chopped my black olives. At this point, your kitchen pretty much smells heavenly. 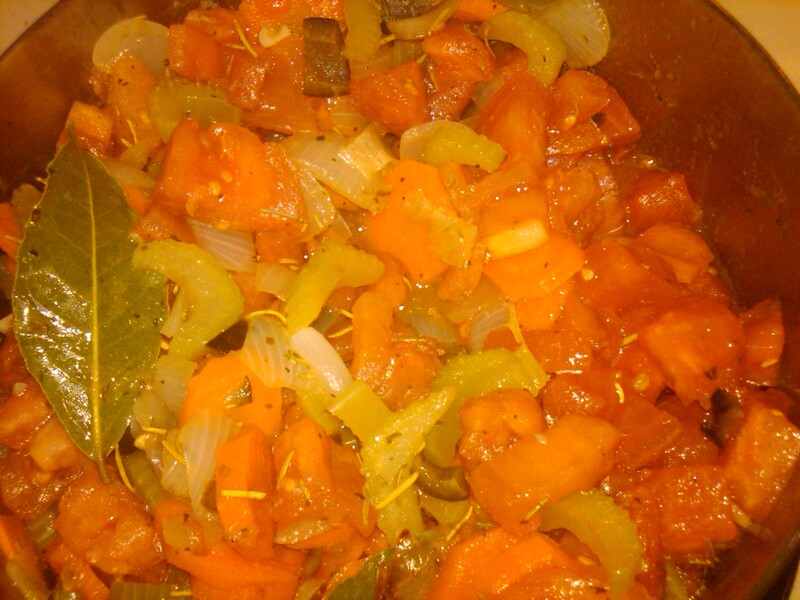 When the veggies are soft, I added the rest of the oil, tomatoes, capers, olives and spices. It says to adjust the spices at this point but be careful because the olives are salty. I decided to let it cook before adding salt because who wants too-salty sauce? Not this girl! Adding spices, capers, and olives. Yes, I DID almost forget the tomatoes. But never fear. Here they are! 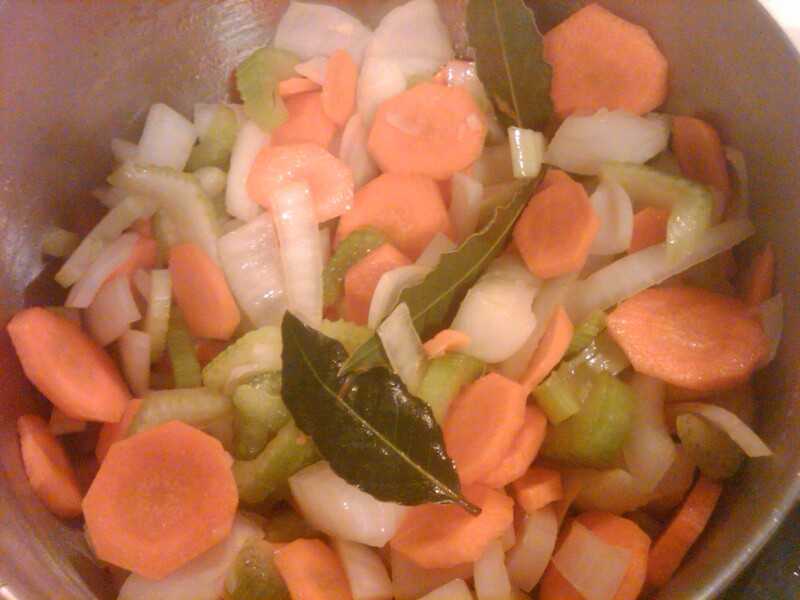 Bring it to a boil, then reduce the heat to low and let it simmer for several hours. I ended up letting mine cook for about 3 hours, and I added my final salt and pepper with about a half hour to go. 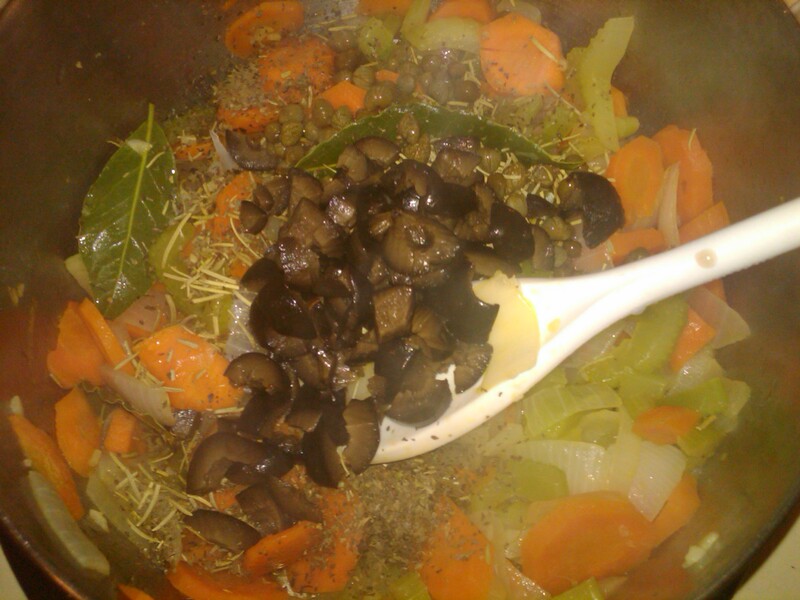 Everything’s mixed well and starting to simmer…. You’re supposed to make a well with your flour then add your salt, water and eggs to the middle. But what I ended up doing was making a well. 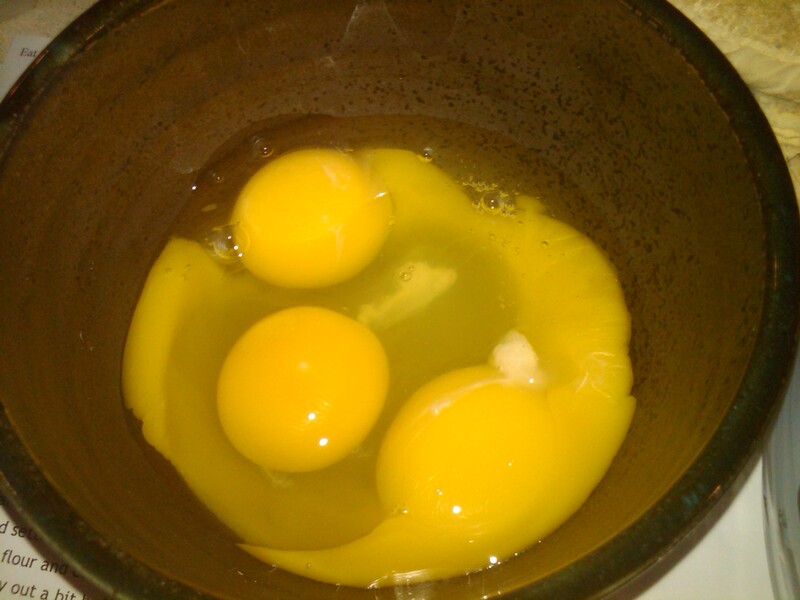 Then beating together my egg, water and salt separately before dumping it into the well. I watched a video on noodles and one trick is adding in the flour very slowly. I don’t know if this even matters, but I did. Next time I’ll try beating the egg mixture in my mixer. 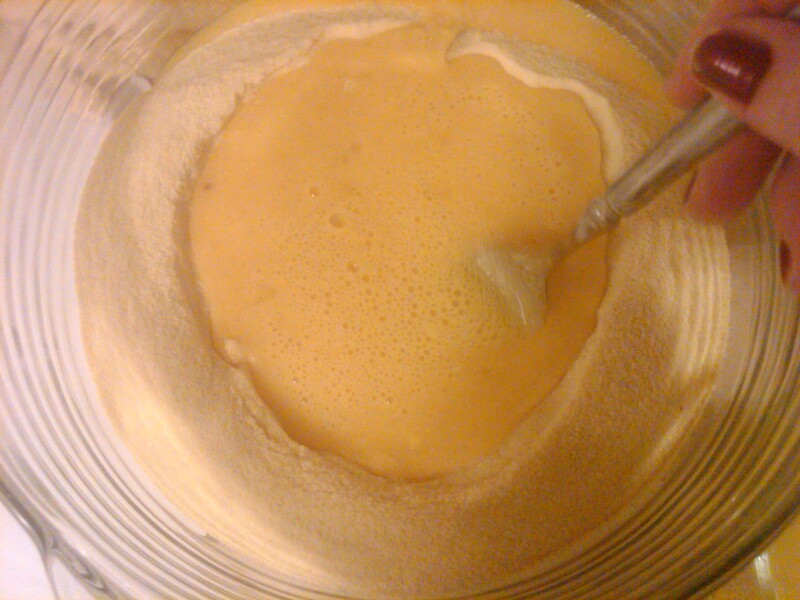 Then slowly adding the flour to that mixture until it’s mixed. THEN knead it. The process itself wasn’t that hard, but why do I have a KitchenAid mixer if I’m not gonna use it? Not very exciting… But here are the eggs, water and salt. Commence beating. 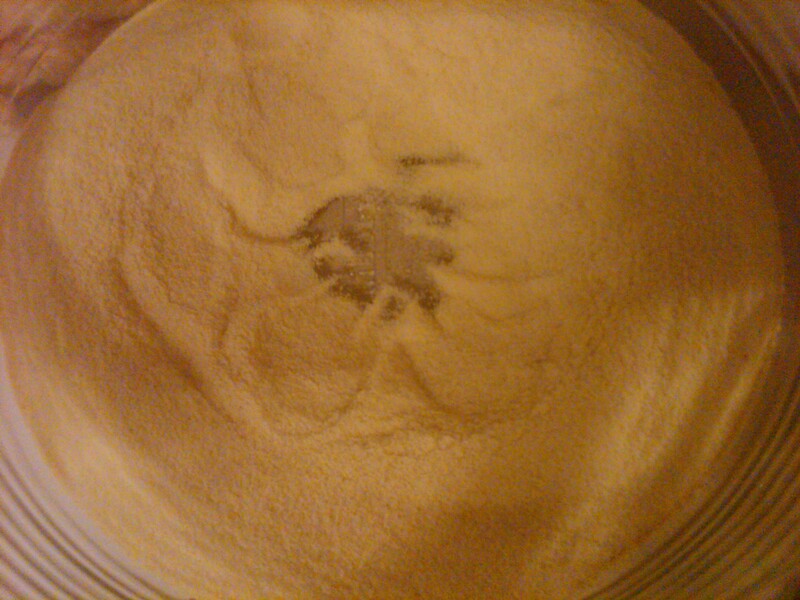 And here’s my semolina flour well, waiting for the eggs to arrive so they can get this party started! And you stir the middle quickly, but only bring a little flour in at a time. Stirring and incorporating well before bringing in more flour. 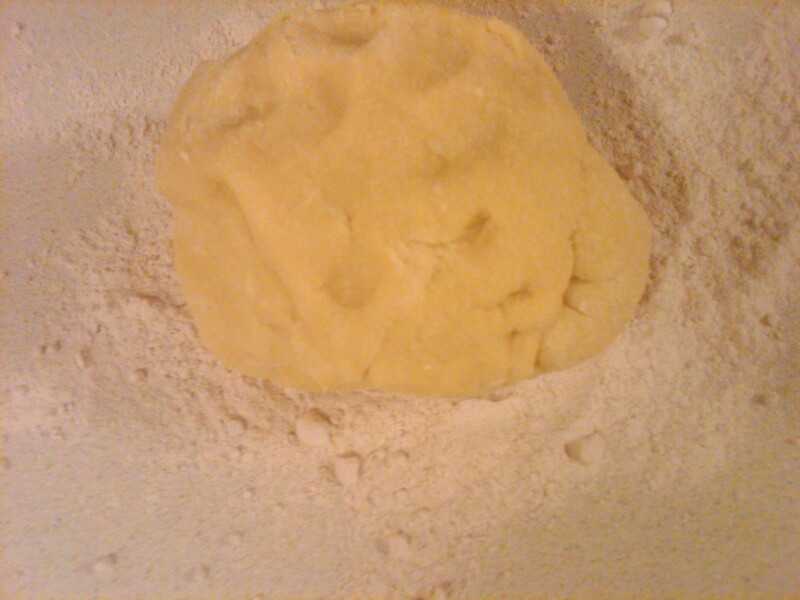 Once all of the flour was incorporated, I kneaded it on a floured surface until the dough was smooth. Then you’re supposed to let the dough rest for an hour. I ended up putting it in the fridge since I wasn’t going to make my lasagna until the next day. However, next time I’ll go ahead and roll out the noodles after letting it rest because cold dough is more pliable. Then I’ll separate the noodles with wax paper, put in a ziplock bag and refrigerate. Finished product. All smooth and whatnot. In the meantime, I also had dough for whole wheat French bread in my bread machine. I always mix the dough in the machine and let it rise, but then bake it in the oven. If you want to eat warm from the oven bread, you’ll make this the second day. I decided I’d rather make it the night before and toast it into garlic toast. I found my French bread recipe on allrecipes.com. I cut the recipe in half (I only need one loaf) and made some minor adjustments based on the comments on the site. First I proofed my yeast using ¼ a cup of the listed water, the sugar and yeast. Meanwhile I measured my flour (I weigh it rather than using measuring cups). I used a total of 13 ½ ounces of flour, plus the 2 tablespoons of vital wheat gluten, and added all of this to the bottom of the bread machine pan. 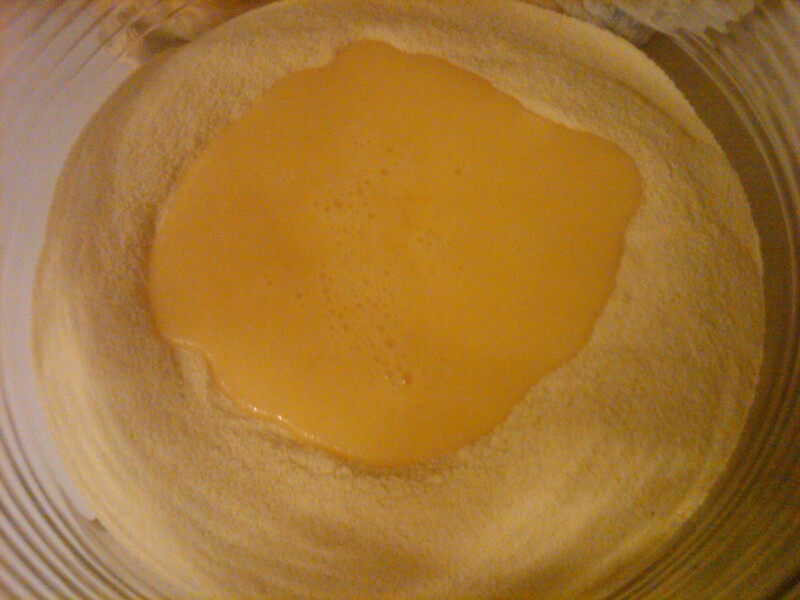 Then I added the salt, remaining water, melted butter and the proofed yeast mixture. 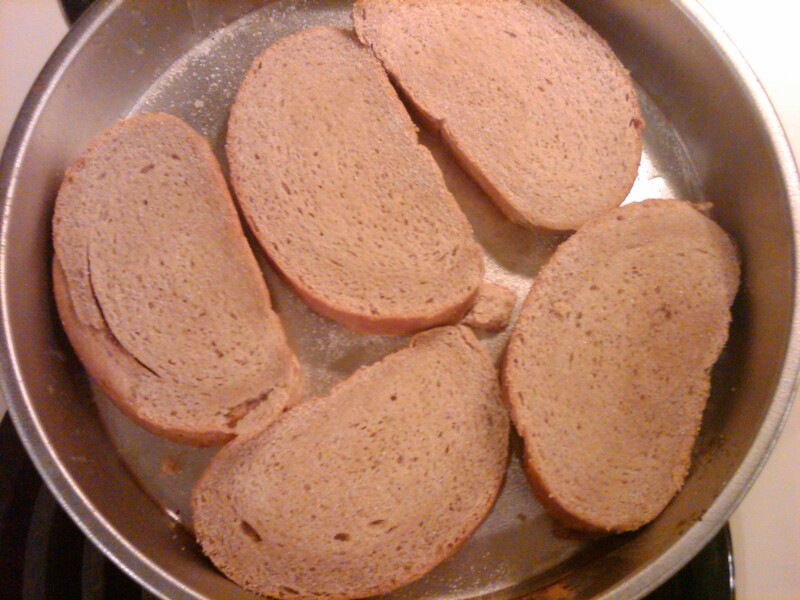 I always stir my bread a little by hand with a wooden spoon to make sure it mixes completely in the machine. I let it go through an entire bread cycle (which includes raising once). Then punch it down and let it rise again for about 40-60 minutes (until doubled). Roll it out into a rectangle and roll it up, starting from a long edge. Once you get to the end, moisten the edge and seal it. Place it on your greased and corn meal coated pan, seam side down. Cut three or four diagonal cuts, about ¼ inch deep. Then brush with egg wash. Cover and let rise for about 30 minutes. Bake at 375 degrees for 20 minutes. Brush with egg wash a 2nd time. Then bake an additional 15-20 minutes, or until the bread is done. If the bread starts to get too brown (mine did), cover it loosely with aluminum foil. Cool on a wire rack. Once it’s completely cool, I store it in a ziplock bag. But I think there’s a trick with storing bread I haven’t figured out, yet. Someone speak up if you have that trick. When my bread was completely cool, I transferred my sauce to a bowl and stored it in the fridge (along with my noodles). Assembly and cooking commences tomorrow! Like I said, I refrigerated my noodle dough rather than rolling out my noodles when the dough was warm and pliable. Because of this, I sat the dough out for about an hour while I did other things. The problem is even after it rested when I rolled it out it was still cold and stiff. (That’s what she said? Or that’s what the coroner said, maybe.) So I’ll repeat, roll out the noodles on day one and refrigerate them. I bought a half pound of sterling silver ground sirloin from Dillons and browned it with one onion and a clove of garlic. Then seasoned it to taste with salt, black pepper and red pepper flakes. For some strange reason I didn’t get a picture of the hamburger actually browning. 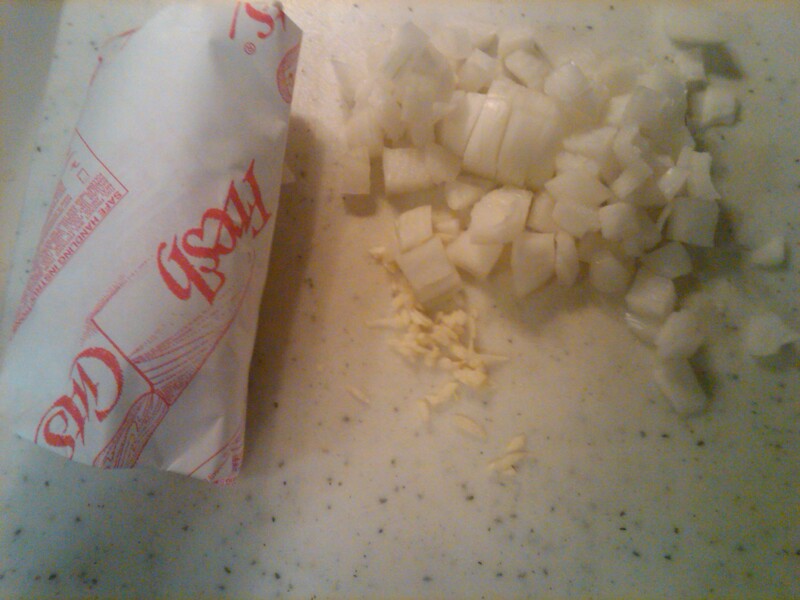 But here it is, hanging out with the chopped onion and garlic. 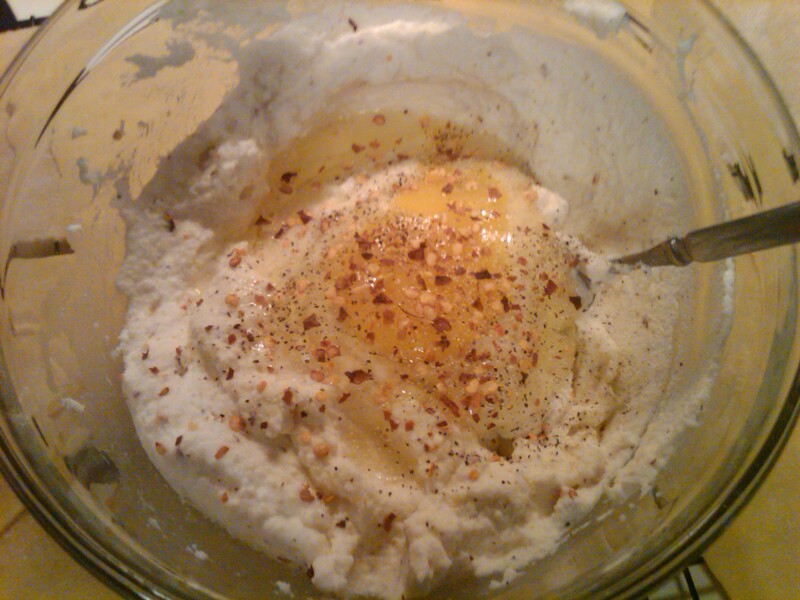 I also mixed together my egg and container of ricotta cheese. I seasoned this as well with garlic salt, black pepper, Italian seasonings and red pepper flakes. Ricotta cheese, egg and whatever seasonings you desire (I used salt, black pepper, red pepper flakes, and ended up adding Italian seasonings at the last minute.) I wish I’d added some fresh basil to this, but I forgot. There was a lot going on! Clearly I’m a firm believer each of my layers should be seasoned to perfection. 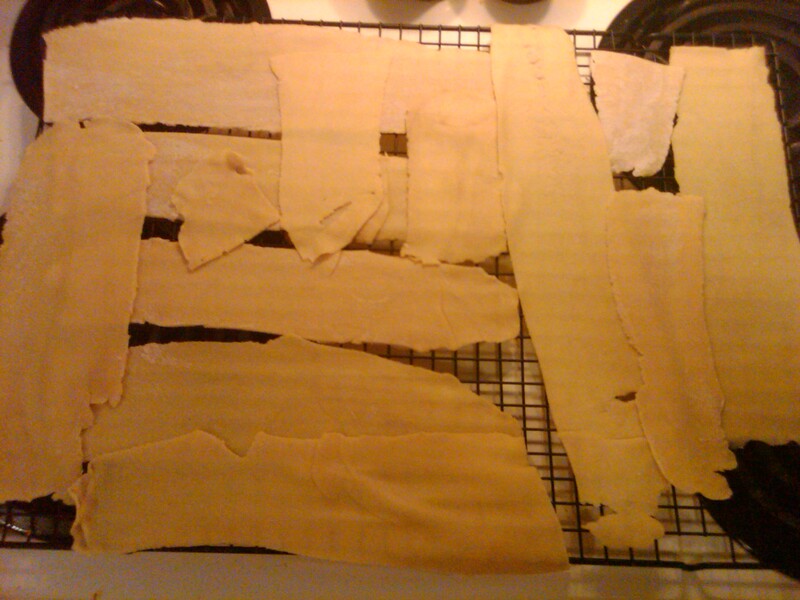 Then I started rolling out my noodle dough. 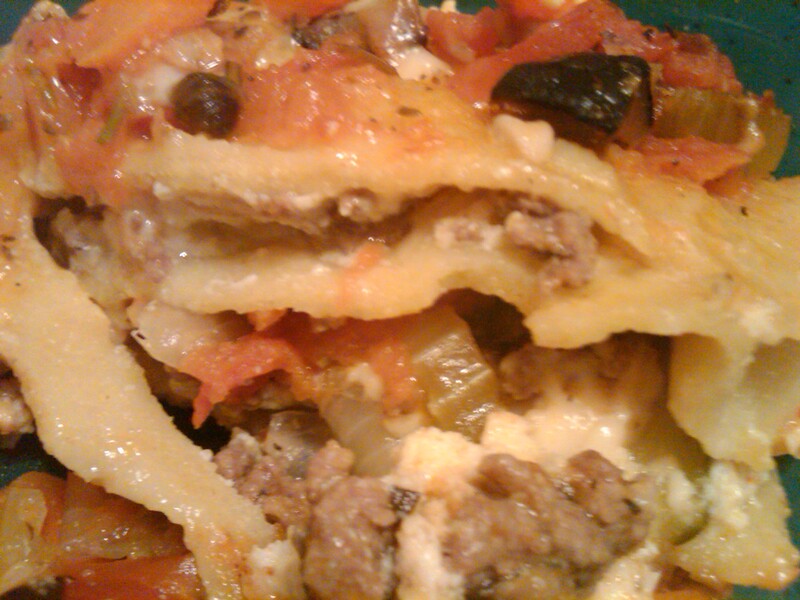 I rolled it as thin as I could get it and cut it into rough lasagna-width noodles. Needless to say, I’m now eying the pasta attachments for my KitchenAid mixer! Anyway, the noodles didn’t come out looking pretty, but it’s not like you can see how they look once this dish is cooked. Don’t judge my noodles. They try really hard. 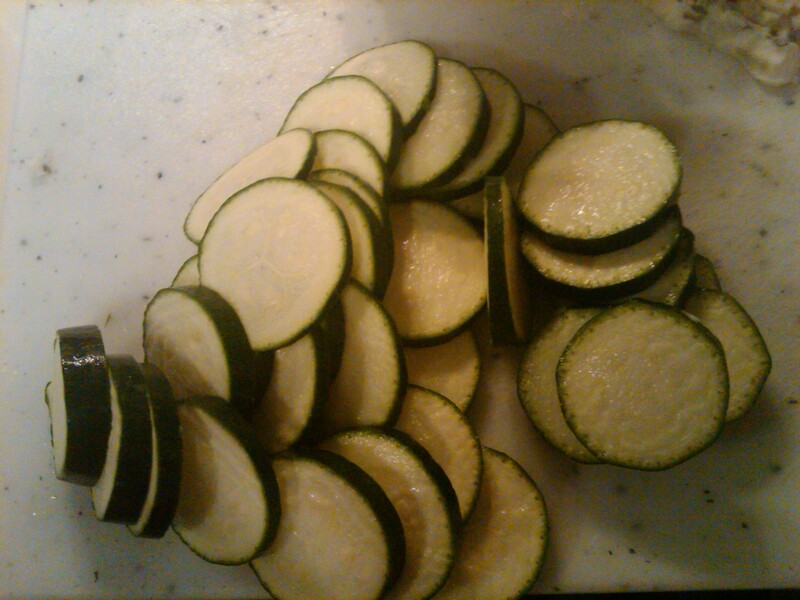 I also thinly sliced a zucchini. Spray a 9 X 13 pan, and spread sauce as the first layer. Then add one layer of noodles, and spread the ricotta cheese mixture on top. 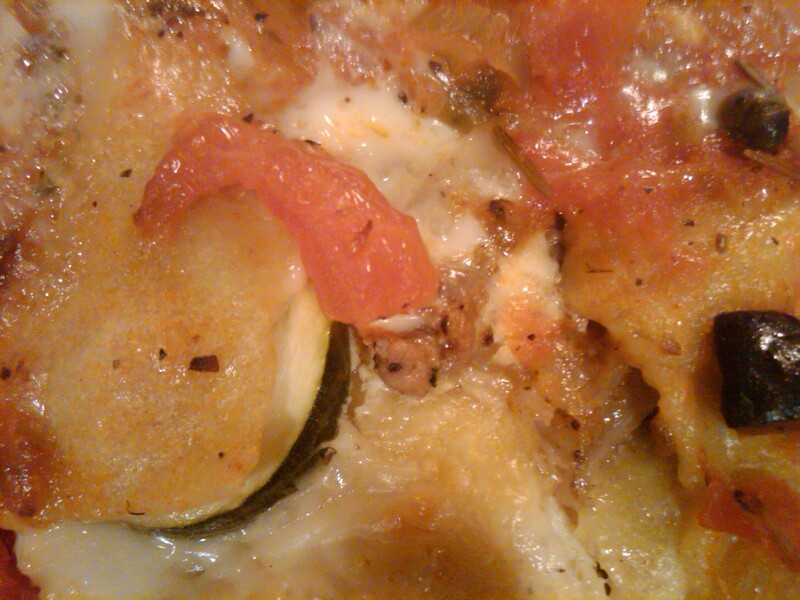 Follow by spaced layer of zucchini and meat. Then sprinkle some of each of the cheeses. Repeat layers until everything’s used up. Make sure the final three layers are noodles, sauce and then topped with cheese. Bottom layer of sauce (my pan is sitting on a cutting board, so it might look like there are noodles under there, but there aren’t). 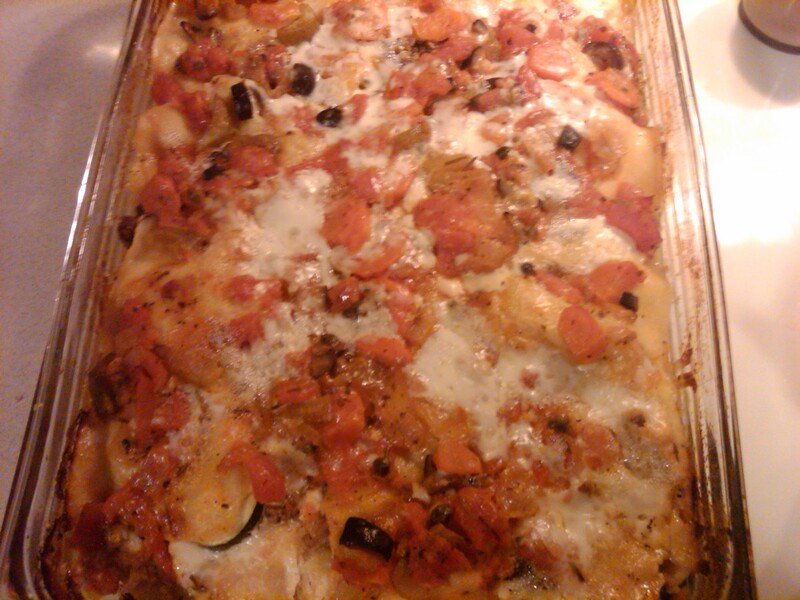 And here it is, just going into the oven. I covered it with foil while it cooked since you can see a lot of noodles showing. 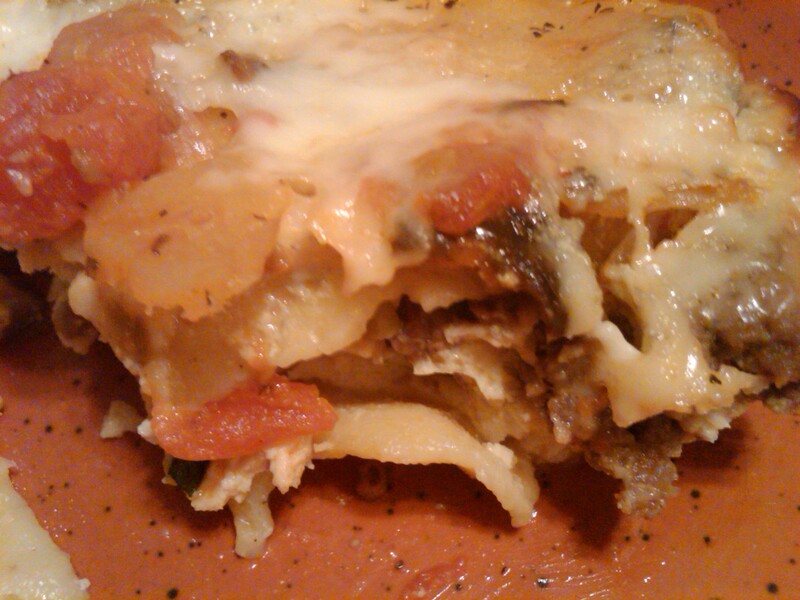 I DO NOT like my lasagna noodles to be all crunchy like chips. I covered my lasagna with foil because I didn’t have as much sauce as I would have liked. I baked it at 400 degrees for about an hour. Next time, when there’s ample sauce, I’ll take the foil off for about the last 10 minutes or so to brown the cheeses a little. Fresh from the oven. Looks blissful, no? 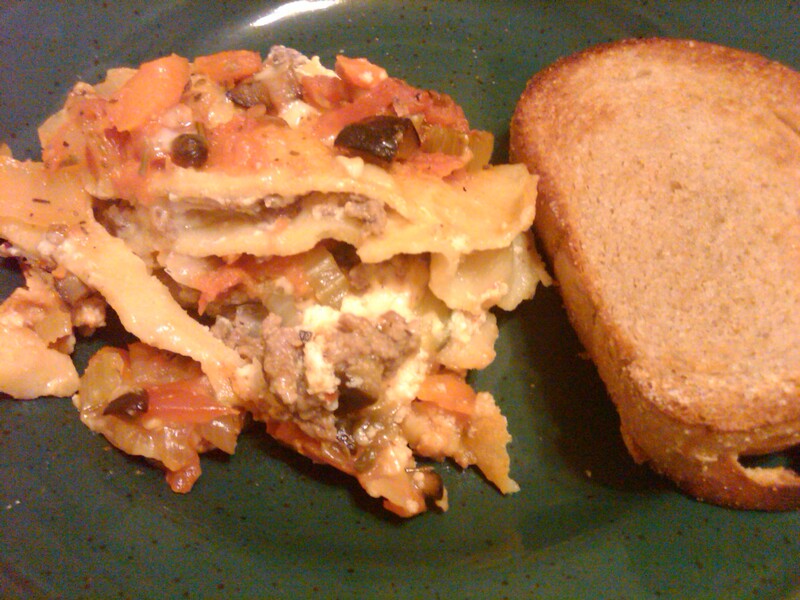 When the lasagna came out of the oven I let it rest while I broiled several pieces of the French bread I made the night before. I always cut my bread slices with an electric knife so the bread doesn’t collapse. Then I simply buttered both sides of the bread and sprinkled on garlic salt. I always broil both sides of my bread. Lightly buttered, and sprinkled with garlic salt. Since the oven’s hot, this is going to cook fast. Don’t go anywhere. 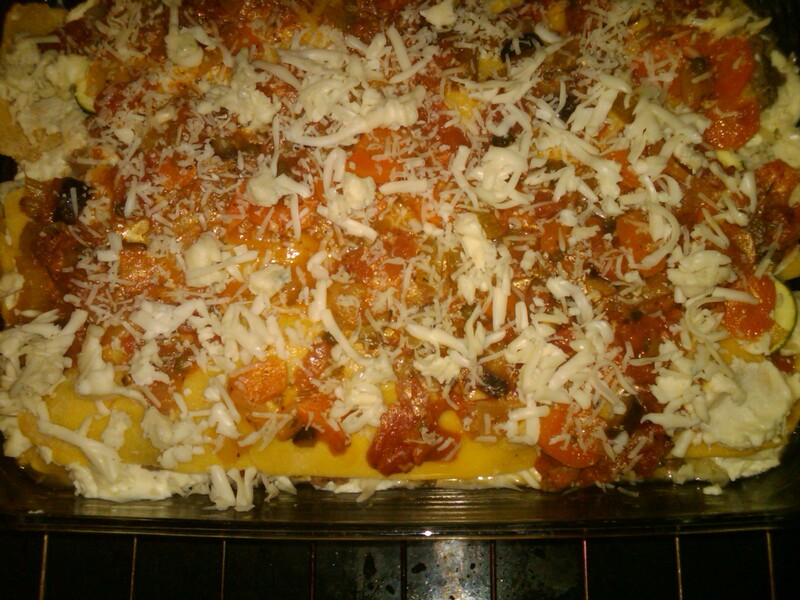 Instead, stay at your oven, and admire the perfection that is your lasagna. 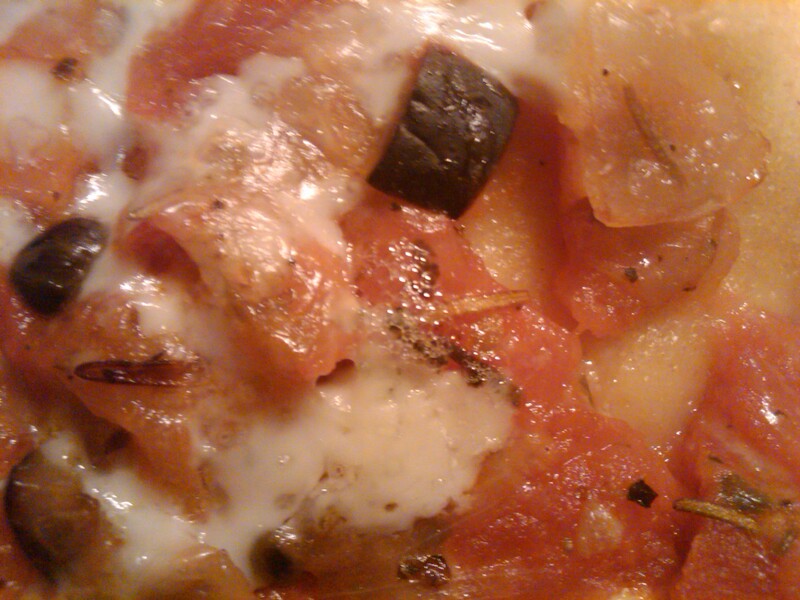 You can see the cheese is barely lightly browned. I did take my foil off for about 2 minutes, then freaked out when the noodles started to get crispy. The result? PERFECTION. (Insert Italian “mwah” here.) Seriously. Karla got a bite of “a stinky cheese” (which I assume was gorgonzola), but I’ve eaten about half of the pan and never had a bit I’ve disliked. 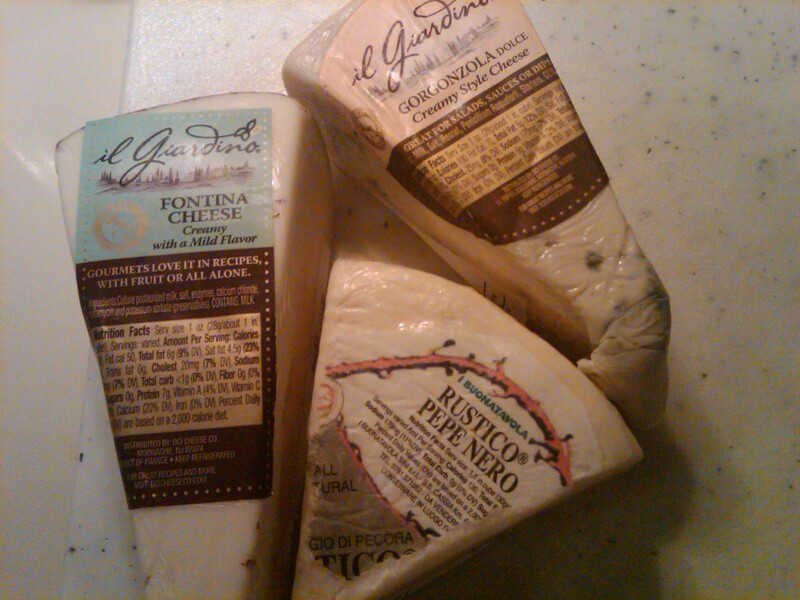 I love cheese, though, even the stinky stuff. So, if you mostly just like mozzarella, I’d say to avoid gorgonzola. It looks a little dry, but it really wasn’t. When I warm up leftovers, though, I do splash it with just a little water. Again, the lack of sauce keeps coming back around! How can you NOT want to make out with this? And here we are with the toasted garlic bread and all. The surprise part of the meal? During all of this preparation, I had cinnamon raisin bread dough rising. And perfectly times, while my lasagna was cooking I put together cinnamon twists, and popped them in the oven as soon as my bread was done (the oven was still mostly warm from the lasagna just coming out). By the time we finished dinner, we had a hot from the oven dessert. PS- If you haven’t read about the cinnamon twists yet, do so at your own risk. They’re all I can think about.